The German manufacturer says that this black-and-white film has much more silver in it than normal emulsions, and can register 14 different tones if developed in its own Silvermax developer. It’s fine-grained and produces rich contrast. It can also be cross-processed in Agfa Scala chemicals to create black and white slide. A replacement for Agfa’s much-loved Scala 200 black-and-white slide film. It’s not a negative film that can be processed as a slide – it’s a slide film. No DX coding, so you’ll have to make sure you manually set your camera’s meter to 160. It can be developed in the same chemicals as Fompan R – which means you can develop at home. An ISO 100-speed black and white film, based on a previous film made by Croatia’s Efke, who went bust back in 2012. It’s regarded as a general purpose film – good for everything from landscapes to portraits – and has a fine grain, similar to Agfa’s old APX. Adox say that “no other film is sharper, no other film is more finegrained, no other film resolves more lines per mm (up to 800 l/mm)”, With an ISO of 20, this film is perfect for still lifes and more studied photography – anything requiring a tripod, unless you have fiercely bright sun to work with. Adox are best known for their low-to-medium ISO black-and-white films, but there’s on product in their range that’s pleasingly out of kilter. Color Implosion is an experimental colour negative film that combines the grain of an 800-speed film but with an ISO rating of 100; perfect for sunny days. “Did your parents drop off a roll of film in the 70s in a one- dollar shop for cheap development and you just found it on your attic?” asks Adox. “In this case your images might look like if they were taken on Color Implosion.” The packaging warns of “toxic grain” and they’re not wrong. This isn’t a film for flattering portraits or documenting a friend’s wedding, but is great for more experimental moments. Definitely one to load in a Lomo LC-A or old-school SLR. You can shoot the film from 100 to 400 and the colour colour palette will change – shoot it at 400 and it will be warmer, with more pronounced reds. Shoot it at 100 and blues predominate. The consensus is this is a Harman Technology film – made by the same people who make Ilford’s black-and-white films. It’s a contrasty, medium-grain film that’s good for shooting in bright weather. It produces rich, deep blacks. A good film for using in summer weather – one to have in the bag for holidays perhaps. See more: There’s a Flickr group with thousands of images taken on this and its sister film, APX 400. Similar to the APX 100 film, this is an all-round black-and-white film with considerably less contrast than the harder, chalk-and-charcoal Tri-X or Ilford’s HP5. The softer look of APX 400 steers it towards studio work and portraits, or landscapes/street pics that aim for a more reflective mood. First the bad news; this isn’t the wonderful Agfa original back from the grave – which was not only a great consumer slide film, but the best E-6 film to cross process. What it is is rebadged Fuji Provia 100F. It’s taken from the edge of the master roll when it’s processed, the area most likely to have slight imperfections in tone or colour. You’re unlikely to see any sign of this when shooting it nomally – and at little more than half the price of a roll of Provia, it’s a more affordable way to shoot slide. Unless you like garish, toxic greens DO NOT shoot this film cross-processed. The results are truly awful. 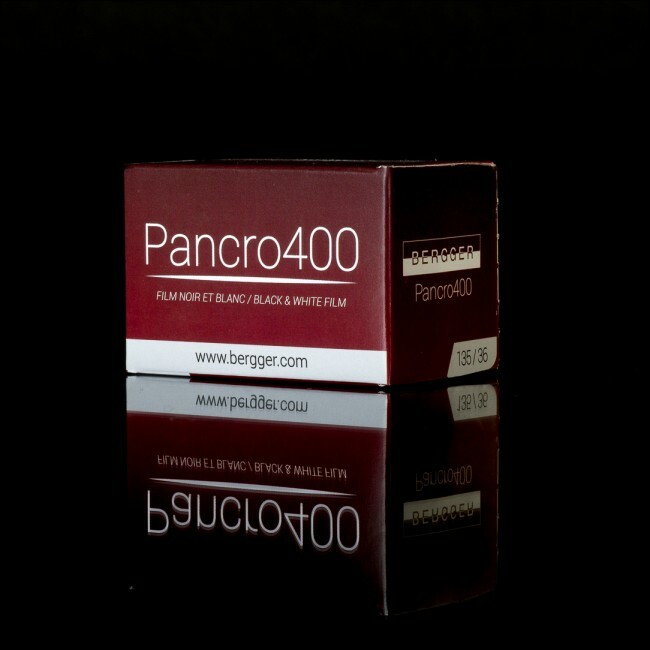 One of a raft of new – or previously retired film – announced so far in 2017, French company Bergger’s 400-speed black-and-white film is a fine-grained 400-ISO film made, according to Bergger literature, with silver iodide and silver bromide, and a layer which helps prevent it curling after developing. Initial reports – as this film only came out in January – point to a sensitivity to the red end of the spectrum. Announced at Photokina in 2016, Bergger released the 35mm version of the film in January. A recent new player to have arrived in the film photography world, Hollywood-based Cinestill take Kodak motion picture film – in this case Kodak’s 50D – and treats it so that it can be developed in ubiquitous c-41 chemicals. The result is an ultra-fine grain film for well-lit conditions, boasting bright but no over-saturated colours. It’s really useful to have a 50 ISO film – many older cameras have relatively long fastest shutter speeds – sometimes 100 or 200 ISO film will forces you to use narrow apertures, which you might not want to do. The first of Conestill’s films to be released, the tungsten-balanced 800T is a film made for shooting in low-light conditions, especially indoors under artificial light. Again, it’s a Kodak motion picture film which has had its ramjet backing removed so that it can be developed hassle-free in C-41 chemicals. This film has quickly become a favourite with fashion and portrait photographers for the strong mood it creates. Also, it’s capable of being pushed up to 3200 with no issues – making it the only colour film on the market capable of shooting in such conditions. That’s a big thumbs up for Cinestill. FILM Ferrania announced their return in September 2013, with intentions to bring part of the old factory near Genoa in north-western Italy back to life. This one-time research facility – essentially a miniaturised film production line – was saved from demolition, with the intention that they would first bring back their old Chrome 100 slide film. Instead, the new FILM Ferrania announced earlier this year their first film would be the old P30 black-and-white cinema film, re-engineered for 35mm still cameras. See more: FILM Ferrania has plenty of examples on their P30 page, plus there are around 1,000 pics already on Flickr. France’s Film Washi declares itself the “world’s smallest film company” and this was the first of its films to be released. The big difference with Film W is that it’s handmade and it’s a paper negative, not celluloid. Paper negatives were the standard before Kodak invented the Brownie; paper negatives were often treated with beaver oil so they remained water-tight. This film uses Washi paper from Japan, which is used for watercolours. The images from this film evoke the work from photography’s earliest days in the mid-19th Century, with bold contrast but little fine detail. It looks completely different to any film currently on the market, though it’s not a film you’re going to be able to fdrop in to your local photo store – you’ll have to develop it yourself. And while it’s available in 35mm, its 90cm rolls are un-perforated. Film X is a Film Washi’s colour film – though this is a different beast to the paper-based Film W. This is originally a traffic surveillance film, with gritty grain and a pronounced warm tone; Film Washi have spooled it onto a standard roll (24 frames a roll). It’s able to be developed either in C-41 chemicals or E-6, so you can decide after you’ve shot whether you want slides or negs. Just about the cheapest black and white film you can buy, the Czech-made Fomapan 100 is sharp, contrasty black-and-white film. Even before the Berlin Wall came down it was available in the West, and often allowed photographers on a budget to shoot black and white without breaking the bank. But Fomapan isn’t a cheap-and-cheerful film to use until you can afford something better – it’s an excellent film in its own right, and a worthy competitor to Fuji’s Acros 100. Fomapan films are cheap and readily available in the UK – Fomapan’s a film I use often, especially on travel to sunnier climes. Fomapan 100 is a lot easier to scan than its 400-ISO counterpart too. Many people ignore 200-speed films because they lack both the sharpness of 100 and the atmospheric grain of a 400 ISO film. In sunny weather, most people will go for 100, and if the light’s low, 400-speed film can be pushed to higher ISOs with much better results. Some reviewers have remarked on this film’s old-school feel, likening it to the kind of films that photographers back in the 1950s and 60s might have used. Fomapan 200 is great for portraits, but there’s also plenty of landscape photographers who use it aswell. Another Czech classic, and almost ludicrously cheap. One of the areas where film photographers are spoiled for choice is 400-speed black and white film. Two of the absolute classic emulsions – Kodak’s superlative Tri-X and Ilford’s magnificent HP5 – are still produced. Competing against those means you have to have a film with some special qualities. Fomapan 400’s a softer film, and it doesn’t capture the same biting dark tones that Tri-X can for example. I’ve found that it can be difficult to scan because the shadows tend to look a little muddy. But it has plenty of fans, and carefully developed is capable of lovely results. I’ve had good results shooting in subdued light, both indoors and in overcast conditions. Would I push it to 3200? Probably not – but it’s a cheap general purpose medium speed film. You might find better results scanning if you get it done in store. 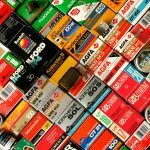 When Agfa Scala was discontinued, analogue photographers lost the last brand of black-and-white slide. Fomapan filled that gap with R 100, which is available for cine cameras and in 35mm. With fine grain and impressive contrast, this has been received very favourably, but it’s a film that requires extra effort – it has to be developed in a special batch of chemicals which rules out dropping it off at the lab; you’ll have to develop this yourself, or ask around on forums to see if there’s a lab – or fellow photographer – who will do it for you. As of writing (August 2016) the film is no longer listed in 35mm on Foma’s website but this has happened before. It’s still in stock with various sellers in the US and Europe. Foma’s most recent films might seem to be an odd choice – sandwiched between their 200 and 400-ISO negative films. But it is a different kettle of fish to the 400-speed film – grainier, and softer in resolution. It does have a really old-school feel, with a glow to the highlights and an enlarged grain that in certain developers looks almost like a 3200-speed film. What are your favourite films from this list? Leave your thoughts in the comments below! This is such a good over of films! Great article, thank you. My favourite films at the moment are Ilford HP5+ and Fomapan 200. Have just bought a selection of Rollei films to try. I really miss Ektachrome 200 and Kodachrome 64 though. Thanks for the message – Ilford will be dealt with in part two. I do love Fomapan 200 (and 100) – they are quality films at affordable prices. My gosh I’ve been looking for an article like this as I’ve recently entered the whole film world. Thank you so much for this and looking forward for the next part! CT100 Precisa is half the price of Provia 100F? Where? Currently on B&H it’s 50% more expensive…? Yes, Fomapan 100 is a nice film, my go-to for ISO 100. I haven’t considered Fomapan 200, but I guess I’ll have to pick up a few rolls to try. Thanks for the list! Enormously useful and I look forward to the remaining parts of this series. And thanks for the hat tip! Very cool that you made this list! It’s nice to see what’s still out there. Thanks for the note – I’ll update that! Excellent article. I use Fomapan 100 and 400, Ilford FP4+ also I have used Kentmere 100 and 400 they are both excellent films. I have even tried some of the cheap Chinese film Lucky SHD 100 with reasonable results. Wot No Agfa Vista? You have dealt admirably well with the black & White/Slide films, so why not the Colour Negative side? Hi Marcus – Agfa Vista is actually rebadged Fuji Superia… so it will be mentioned int he Superia review. Cheers. You might want to point out that silvermax and scala 160 are the same film. Adox just wanted to make it easier for reversal shooters by labeling a version a 160iso (recommended for reversal). I like Fotoimpex CHM 100 & 400, aka Kentmere, aka Adox CHM 125 pro and 400 pro. Work well with Rodinal and I’m just about to try them with a tanning developer, as the old Adox branded film was a great match with the late Barry Thornton’s Exactol. How about all the Film Photography Project films? ?